Join the AFB! 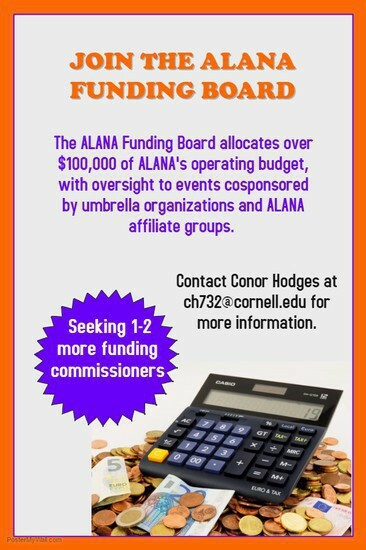 The ALANA Funding Board allocates over $100,000 of ALANA's operating budget, with oversight to events cosponsored by five umbrella organizations and dozens of ALANA affiliate groups. The Board is seeking one-two more funding commissioners to participate in the funding process, principally adjudicating applications for funding with ALANA's treasurer and other Funding Board members. 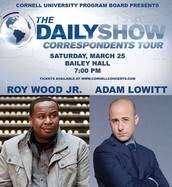 Contact Conor Hodges at ch732@cornell.edu for more information. Several decades ago, students barricaded themselves inside of WSH with the intention of securing institutions that would allow them to flourish within the confines of a predominately white university. 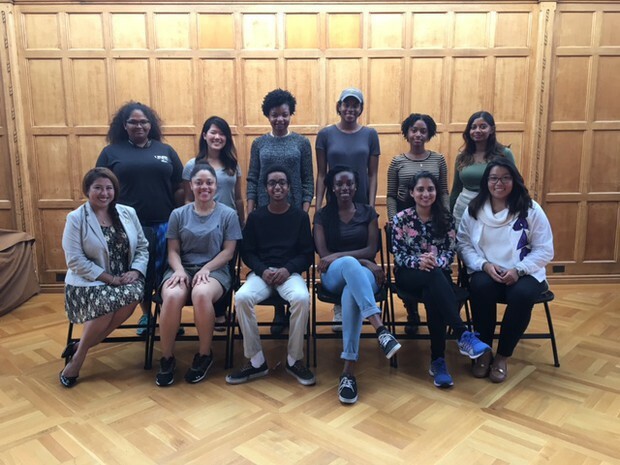 Their courage, initiative, and vision paved the way for the establishment of the Office of Minority Educational Affairs, the founding of Ujamaa Residential College, the rebuilding of the then recently burned down Africana Studies and Research Center, and brought the topic of equality to the forefront of the experience at Cornell. 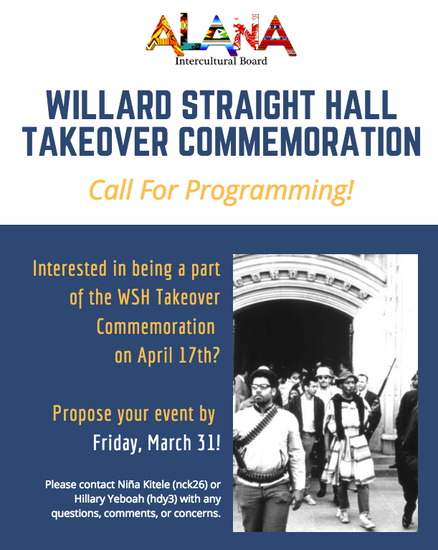 ALANA would like YOU to join us as we honor the intentions of their actions by providing you with the opportunity to hold a program in WSH tied to WSH Takeover. 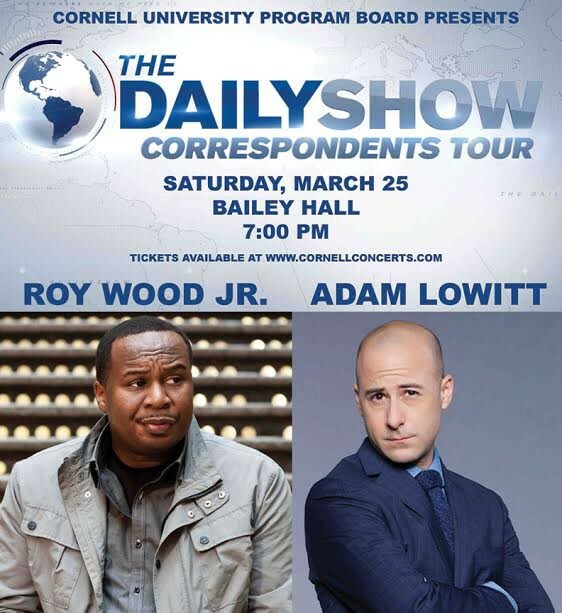 This program can be about activism, the “progress” that your particular community has seen at Cornell, a cultural performance, or the celebration of identity or voice, etc. We are really interested in collaborating with a wide range of diverse groups on campus! If you are interested in this opportunity, the deadline to propose your program is Friday, March 31st. Please contact Niña Kitele (nck26) or Hillary Yeboah (hdy3) with any questions, comments, or concerns. Orientation Leaders are student volunteers who serve as mentors during orientation, helping new students feel at home, engaged, and supported upon their arrival on campus. OLs help move new students into their residence halls, work individually with a small group of new students throughout orientation, and assist at & attend events. 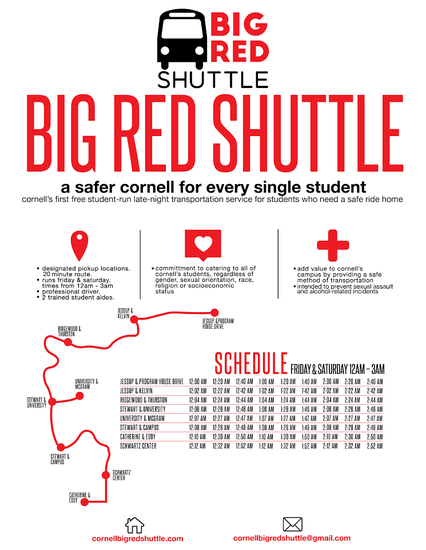 This is a great way for students to get involved on campus, help new students feel welcome, and be part of an important Cornell tradition! Join Black Students United, Haven, TANGO, and Mosaic as we honor the lives and memories of our trans sisters of color Chyna Gibson, JoJo Striker, KeKe Collier, Jaquarrias Holland, Ciara McElveen, Mesha Caldwell, Jamie Lee Wounded Arrow, and others who have lost their lives at the intersections of racialized, gendered, and anti-queer violence. We will commence the vigil with a few words from community speakers, a musical performance, followed by a Reading of Names and a moment of silence for each sister we have lost in 2016 and 2017. We will come together not only to mourn, but to begin an ongoing conversation about ways to actively advocate for and support members of our communities affected by these multiple forms of oppression. We will join together in solidarity to display our resistance against the systems that recreate this violence. Trigger warning: this event will include discussion of sexual, intimate partner, and physical violence, primarily in reference to acts against trans and queer people. 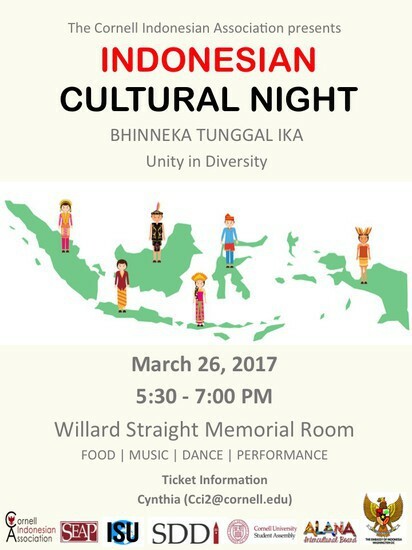 This year, we will also showcase Indonesian culture and authentic food, and hope to see everyone there. Do you have photos that capture special moments in our community? Is your organization looking for a way to be remembered in history? 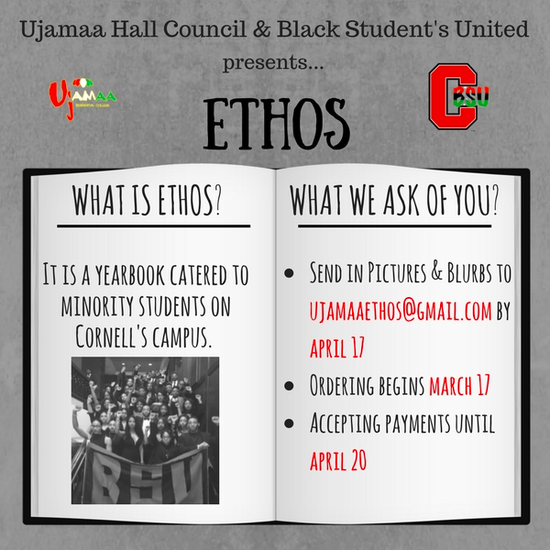 Don't miss out on the opportunity to be featured in our yearbook, Ethos! We welcome all photo submissions with an accompanying caption. Submissions are open now, don't waste time! Send your pictures to ujamaaethos@gmail.com ASAP!